10 ultra-thin winged pads for regular flow Sustainable, biodegradable bamboo & corn fibre pads in recyclable packaging Tsuno supports One Girl and other charities helping to empower girls & women Tsuno’s ultra-thin pads for daytime use on regular-flow days are made from super-absorbent bamboo fibre, with a top sheet of soft, natural corn fibre and a breathable under layer of leak-proof polyethylene. Manufactured without chlorine or dioxin bleach, they’re also winged for extra protection. 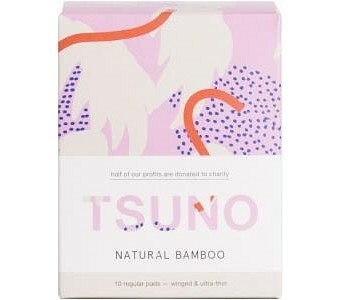 Use them with confidence, knowing that you’re helping both the planet Earth and its vulnerable women and girls: Requiring little water and no pesticide, bamboo is one of the most sustainable and least resource-intensive crops around, and these pads are 100% biodegradable and/or recyclable with the exception of the polyethylene film ( which they are currently working on a biodegradable alternative for ). 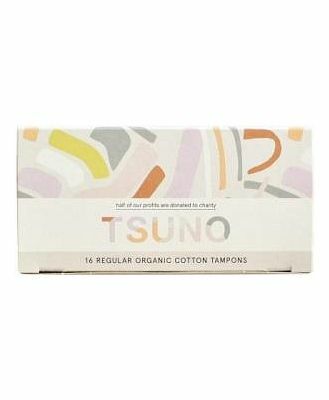 Tsuno donate half their profits to One Girl and other charities helping girls and women with education and menstrual support.